Quinoa: A Sacred, Super Crop Considered a sacred crop by the Incas, quinoa has been classified as a "super crop" by the United Nations because of its high protein content. Quinoa plants produce nutty, earthy-tasting kernels that are great in pilafs, soups and porridges. Quinoa plants grow at high altitudes and produce round, highly nutritious kernels that can be boiled into pilafs, turned into soups, stirred into breakfast porridge or ground into flour. 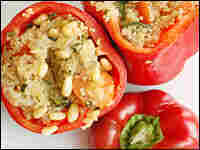 Recipes for quinoa-stuffed peppers, quinoa breakfast porridge and garlic-toasted quinoa with vegetables. 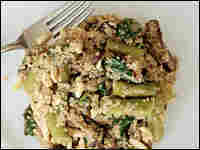 Nicole Spiridakis lives in San Francisco and writes about food, travel and her native state on her cooking blog, cucinanicolina.com. When she's not in her (tiny) kitchen working on a new dish, she writes a column about apartment living for the San Francisco Chronicle's Home and Garden section. I've been making quinoa (pronounced KEEN-wah) since a friend practically force-fed it to me in college. "You're a vegetarian," she said, ladling out a heaping spoonful. "This stuff is a complete protein — you gotta eat it." This was early on in my meat-free career, and I was more accustomed to eating pasta, potatoes and more pasta. I looked askance at the pot of crumbly white seeds. When it was piled high on my plate and augmented with sauteed squash, I still wasn't at all sure I'd like it. But I took one bite, and I was hooked. After that, plain old rice just didn't cut it anymore. 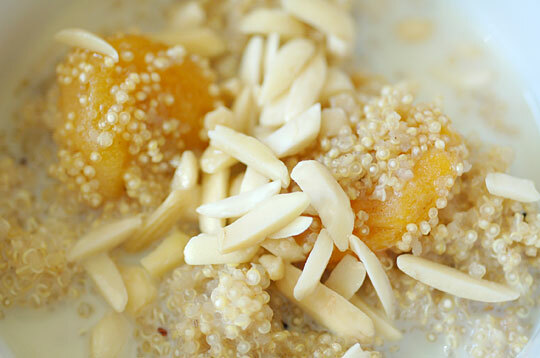 I love the texture of quinoa — a bit crunchy and chewy, still firm after cooking — and its nutty, earthy flavor. Quinoa plants grow at high altitudes and produce round kernels that can be boiled into pilafs, turned into soups, stirred into a breakfast porridge or even ground into flour. Of course, one doesn't have to be a vegetarian to appreciate the glories of quinoa. It has been a quiet essential on the global plate since pre-Columbian civilizations. The Incas considered it sacred, and held it in such high regard that they referred to it as chisaya mama, or mother of all grains, because of its nutritional properties and ability to survive the harsh environment found at high altitudes. I like to imagine an ancient emperor sowing the season's first seeds, as was the custom, moving magisterially through mountain fields under a blazing sun. Later, there would have been a solemn ceremony, perhaps, and an indulgence in chicha, a beer made from fermented quinoa. What was a sacred crop to the Incas has been classified as a "super crop" by the United Nations because of its high protein content. It is a complete protein, which means it has all nine essential amino acids. It also contains the amino acid lysine, which is essential for tissue growth and repair, and is a good source of manganese, magnesium, iron, copper and phosphorous. While many think of quinoa as a grain, the yellowish pods are actually the seed of a plant called chenopodium quinoa, native to Peru and related to beets, chard and spinach. The plant resembles spinach, but with 3- to 9-foot stalks that take on a magenta hue. The large seed heads make up nearly half the plant and vary in color: red, purple, pink and yellow. In the Andes Mountains, where they have been growing for more than 5,000 years, quinoa plants have overcome the challenges of high altitude, intense heat, freezing temperatures and little annual rainfall. Peru and Bolivia maintain seed banks with 1,800 types of quinoa. It has been grown in the U.S. since the 1980s, when two farmers began cultivating it in Colorado. As I stumbled my way toward healthful eating in my early vegetarian days, I turned again and again to these ancient seeds. They can be prepared equally well as a savory or sweet dish. 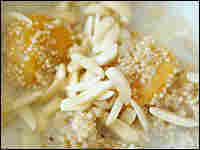 A variation of a breakfast cereal, for example, with honey and dried fruit, is delicious. I used quinoa in place of my usual white rice with vegetable stir fries to great effect. I even foisted it on my unwitting dining companions, who also had initial trepidations when I presented them with a steaming bowl. They, too, came around. I'd eschewed meat but I still needed protein — and with 12 percent to 18 percent protein content, quinoa fit the bill. 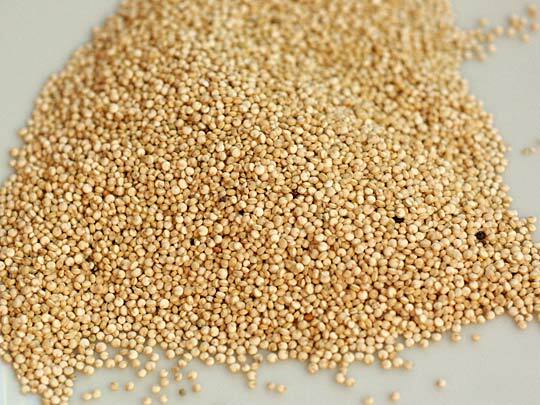 When preparing quinoa, rinse the seeds before cooking to remove any lingering soapy saponin. 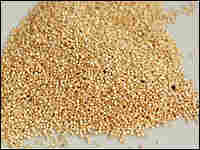 The coating, which protects growing seeds from birds and the intense rays of the high-altitude sun, can make your quinoa taste bitter. (A quick rinse in cold water, after placing in a strainer, should do the trick). Then add one part quinoa to two parts liquid in a saucepan, bring to a boil, reduce to simmer and cover. In a mere 15 minutes, the seeds will be plump, fluffy and ready to eat. For years, I took a quinoa soup mix with me on backpacking treks in the Point Reyes National Seashore. After a six-mile hike through Northern California's bay leaf-scented forests out to the Pacific, I'd set up camp and get water from a nearby stream. I felt my muscles — good and sore after the long journey — relax as I eagerly anticipated the first spoonful of soup: chewy, hot and infinitely satisfying. Somehow, this grain from a distant land seemed just the thing to have while spending the night in a campground by the sea. Of course, it tastes just fine as a morning pick-me-up or quick weeknight supper, whether you're vegetarian or omnivore. Grease a small (approximately 7 inches by 11 inches) baking dish. Heat the olive oil in a medium, heavy-bottomed pot. Add the onion and saute a few minutes until soft. Add the zucchini, yellow squash, fennel seeds, oregano and salt. Cook, stirring frequently, for 5 minutes or until vegetables soften. Add quinoa and stir to incorporate. Quickly add the broth or water, bring to a boil, then reduce to a simmer for about 15 minutes or until water is absorbed. Remove from heat and stir in the tomatoes, pine nuts and basil. 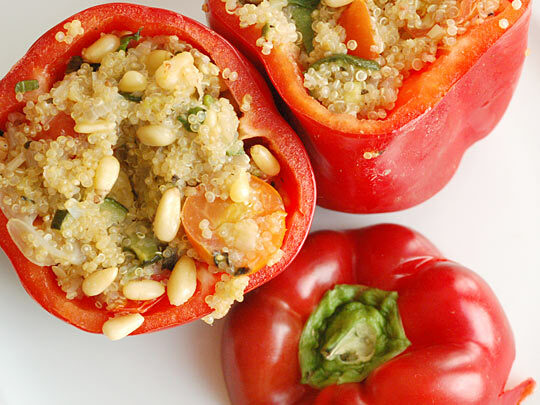 Place the peppers upright in the baking dish and fill them with the quinoa mixture, topping each with its top. Bake 30 minutes. Serve immediately, with a salad and roasted potatoes. A twist on the traditional oatmeal breakfast, this will keep you full for hours. Bring the water to a boil, and add the quinoa. Reduce heat and simmer 5 minutes. Add the cinnamon and apricots, and simmer until water is absorbed. Add the almonds. Serve with milk, soy milk or cream, and sweeten to taste with honey or brown sugar. This is a restorative and healthy meal after a run, or a long day in the office. Saute garlic in 2 tablespoons oil in a large pot over high heat for 2 minutes or until tender. Add quinoa and another tablespoon of oil to coat the quinoa. Reduce heat to medium and toast, stirring constantly, until the quinoa turns brown (about 10 minutes). Add the broth or water and bay leaf, and bring to a boil. Reduce heat, cover and simmer for 15 minutes (until liquid is absorbed). While the quinoa is cooking, saute the mushrooms in remaining 2 tablespoons of oil until soft. Add asparagus and cook until just tender. Add the greens and cook until wilted. Remove bay leaf and add the mushroom and greens to the quinoa. Add the almonds, and stir well to combine. Season with the soy sauce.